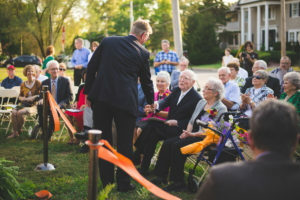 In the fall of 2016, Greenville College welcomed the opening of the Donald N. and Kathleen G. Bastian School of Theology, Philosophy, and Ministry. Just as the Briner School of Business replaced its respective department last year, the Bastian School is designed to replace the Philosophy and Theology Department. These efforts are a part of the remodeling Greenville College is undergoing as it prepares to transition into a university. The transition aims to give the Bastian School more independence and autonomy, and to allow the faculty greater freedom to cater to the needs of the students within the school. 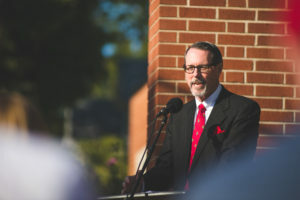 As explained by Dr. Brian Hartley, Vice President for Academic Affairs and Department Chair of Philosophy and Theology, the new school is designed to aid in “expanding our reach” to potential students of theology, philosophy, or ministry. The school is named after Donald and Kathleen Bastian. Donald Bastian, a 1953 Greenville alum, has served as the bishop emeritus of the Free Methodist Church of North America and of the Free Methodist Church in Canada. However, before his appointment as a bishop, Donald served as the pastor of the College Free Methodist Church in what Greenville students now know as Whitlock Music Center. 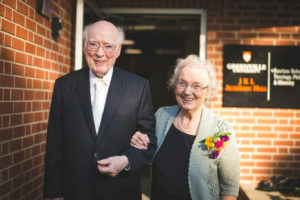 Donald and his wife served Greenville College in this capacity from 1961 to 1974. Doug Newton, pastor of the Greenville Free Methodist Church, opened in prayer; he was followed by Bishop David Kendall and Dr. Brian Hartley, who discussed the mission of the school: “to occupy the land not of the either-or, but of the yes-and.” Hartley reiterated that the Bastian School aims to unite the “head and heart,” or the church and academia. Robert Bastian, one of Donald and Kathleen’s sons, spoke on their behalf and expressed the Bastians’ hopes for the school. Finally, Alan Gaffner, Greenville College alum and mayor of Greenville, declared Wednesday, October 5th, 2016, Donald and Kathleen Bastian Day and presented the Bastians with a key to the city. Bishop Donald, Kathleen, and their children then cut the ribbon with President Filby, officially opening the school. President Filby concluded, “Today is a good day.” The Bastian School of Theology, Philosophy, and Ministry will continue to be a symbol of the mission of Greenville College for many years to come. The Rise and Fall of Pokemon Go?